Your Aunt never looked so cool as when she wears this Personalized Awesome Aunt Sweatshirt. Our World's Greatest Sweatshirt also make excellent Personalized Aunt Gifts. Available on our premium white cotton/poly blend Sweatshirt, machine washable in adult sizes S-3XL. Also available in Ash and Pink. All Gifts for Aunts include FREE Personalization! 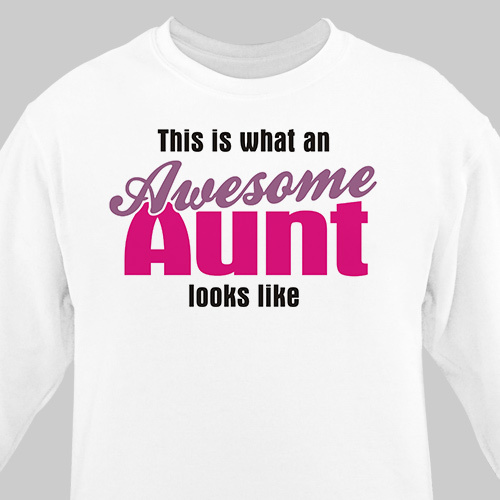 Personalized your Awesome Aunt Sweatshirt with any title. Tell the whole World who the Best aunt is with our Awesome Aunt Shirt. Our Personalized Aunt gifts make great gifts for Birthdays, Christmas & Mother's Day. Express your love for your Aunt with our Personalized Aunt Gifts.